Please join the Friends of Sausal Creek (FOSC) this Wednesday night for a presentation on “Peregrine Falcons: Population Recovery and Beyond” from 7-9 p.m. at Dimond Library, 3565 Fruitvale Avenue, Oakland. Learn about peregrine falcon population recovery efforts from bird bander and conservation biologist Glenn R. Stewart, director of the University of California Santa Cruz Predatory Bird Research Group. 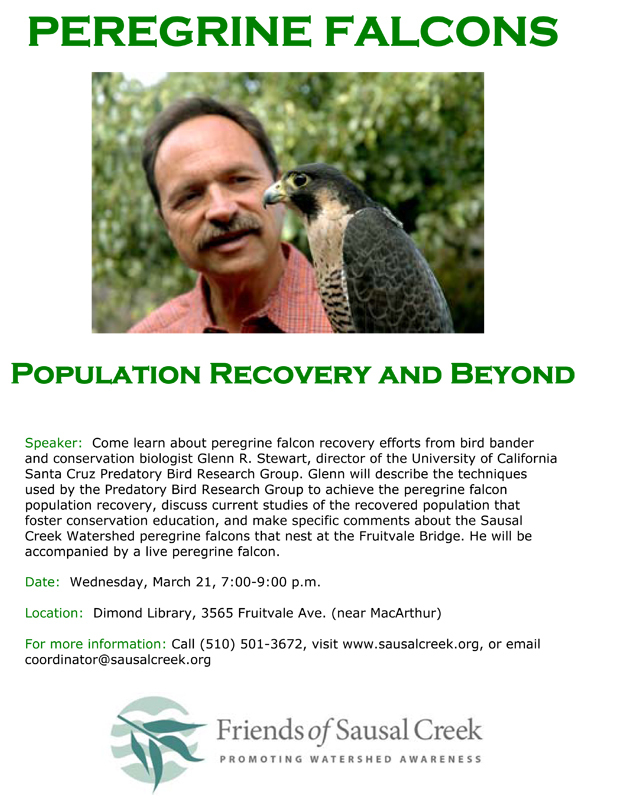 Glenn will describe the techniques used by the Predatory Bird Research Group to achieve the peregrine falcon population recovery, discuss current studies of the recovered population that foster conservation education, and make specific comments about the Sausal Creek Watershed peregrine falcons that nest at the Fruitvale Bridge. He will be accompanied by a live peregrine falcon. All are welcome!